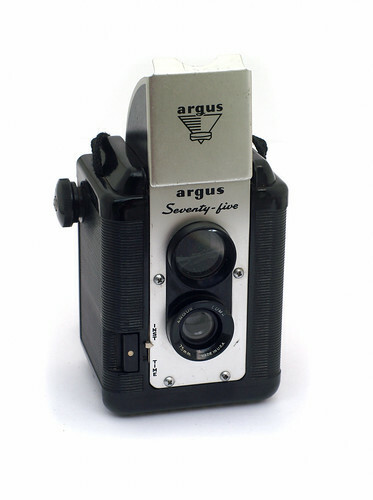 The Argoflex Seventy-Five and Argus Seventy-Five were two name variants of the same model of pseudo TLR, produced by Argus in the USA, beginning in 1949. The main body was molded from plastic (perhaps bakelite), while the film door is a painted metal casting. The front panel and viewfinder hood are in a contrasting satin-finish metal. A cloth neckstrap is permanently attached to the top of the body. Images were 6x6cm on 620 film. While essentially a simple camera, it did feature double-exposure prevention, as well as a clever reminder when the film has been wound: A red-painted shutter blade is visible through the taking lens only after the shutter is cocked. Frame spacing relied on a simple red window, however. The lens was branded as a 75mm Lumar, and was a single meniscus element in front of a fixed aperture of approximately f/11. A version sold in Australia has Argus Lumar 75mm Made in Australia printed on the lens mount. Next to the shutter release, a small slider selected between "Inst" (instant) and "Time" (actually bulb). A standard Argus Seventy-Five kit would typically have included a leather protective case, flashbulb holder (mounted with two pins 1-3/16" apart), and a slip-on accessory "portrait" lens to focus in the 3 to 4 foot range. The final version of the Seventy-Five in production until 1964 received a modest redesign of its graphics, becoming the Argus 75. Argus also offered two higher-specification variations on the Seventy-Five, adding a focusable lens: the Argus 40 and the Argus Super Seventy-Five. Owners hoping photograph with a Seventy-Five using currently-available 120 film will find that a 620 take-up spool is required. It is impossible to fit a 120 spool into the take-up compartment, as its dimensions are too small in all directions. However, a fresh roll of 120 can just barely be squeezed into the supply compartment, perhaps with some trimming down of the spool flanges. This page was last edited on 12 March 2019, at 01:11.